The coastal village of Pilling is situated 6.5 miles (10.5 km) north-northeast of the market town of Poulton-le-Fylde and 9.4 miles (15.1 km) south-southwest of the historic city of Lancaster. The village is an ancient settlement, founded on what was essentially an "island" with the sea on one side and marsh on the others. There is evidence of human activity within the area dating back to the Neolithic period. Pilling Windmill (pictured left) was built in 1808 by the Fylde millright, Ralph Slater. The mill stands 73 feet tall and is the tallest on the Fylde coast. The mill measures 30 feet in diameter at the base tapering to 17 feet at the curb. Superb views over the Fylde coast up to the Lake District and the Pennines may be had from the top. The mill once had a water wheel at the side. It converted to steam power in 1886 and the sails were removed the following year. The mill continued to operate up until the 1940s, after which it fell into a state of disrepair. By 1975 the wind mill had been restored for use as a private residencewhich it is still used as today. 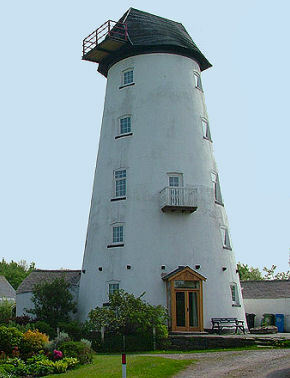 The top of the windmill was restored with a traditional “Lancashire boat top” cap in 2007. The mill now appears as it did in the nineteenth century. 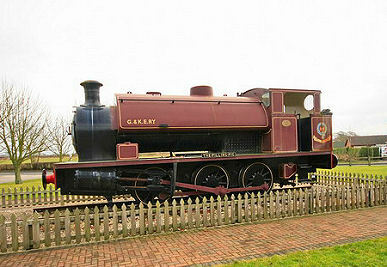 The Pilling Pig (pictured right) a preserved steam locomotive, is sited by the entrance to a holiday park. This is on the site of the Garstang and Knott End Railway, which operated to Pilling from 1870 to 1963, and onto Knott End from 1908 to 1950. The train became known as the Pilling Pig, due to its whistle. Pilling has two pubs, The Elletson Arms in Stakepool and The Golden Ball in the village. There are also several churches, including St. John the Baptist Church (Church of England) in the village, St. William's Church (Catholic) in Stakepool, and the Pilling Methodist Church in the village. Pilling Sands Beach a large sandy area at low tide with salt marsh looking north over extensive intertidal sands towards Morecambe bay, links to a coastal path and some of the sands nearby are designated as the Wyre and Lune Sanctuary nature reserve.